California bay leaf – the leaf of the California bay tree ( Umbellularia californica, Lauraceae), also known as California laurel, Oregon myrtle, and pepperwood, is similar to the Mediterranean bay laurel, but has a stronger flavour. 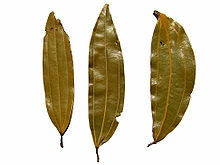 Indian bay leaf or malabathrum ( Cinnamomum tamala, Lauraceae) differs in that bay laurel leaves are shorter and light to medium green in colour, with one large vein down the length of the leaf, while tejpat (Cinnamonum tamala) leaves are about twice as long and wider, usually olive green in colour, and with three veins down the length of the leaf and is culinarily quite different, having a fragrance and taste similar to cinnamon (cassia) bark, but milder. 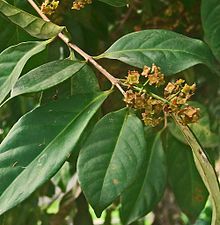 West Indian bay leaf, the leaf of the West Indian bay tree ( Pimenta racemosa, Myrtaceae), used culinarily and to produce the cologne called bay rum. Mexican bay leaf ( Litsea glaucescens, Lauraceae). The leaves contain about 1.3% essential oils (ol. lauri folii), consisting of 45% eucalyptol, 12% other terpenes, 8-12% terpinyl acetate, 3–4% sesquiterpenes, 3% methyleugenol, and other α- and β- pinenes, phellandrene, linalool, geraniol, terpineol, and contain lauric acid also. In Indian and Pakistani cuisine, bay laurel leaves are sometimes used in place of Indian bay leaf, although they have a different flavour. They are most often used in rice dishes like biryani and as an ingredient in garam masala. Bay (laurel) leaves are frequently packaged as tejpatta (the Hindi term for Indian bay leaf), creating confusion between the two herbs. In the Philippines, dried bay laurel leaves are used in several Filipino dishes such as menudo, beef pares, and adobo. ^ "Spice Trade: Bay Leaf". Archived from the original on 12 April 2009. Retrieved 2009-04-11. ^ "Spice Pages: Indonesian Bay-Leaf". Retrieved 2012-12-01. ^ "Encyclopedia of Spices: Bay Leaf". Retrieved 11 April 2009. ^ "How to Repel Grain Moths with Bay Leaves". Retrieved 2009-04-11. ^ Palacios, S; Bertoni, A; Rossi, Y; Santander, R; Urzua, A (2009). "Efficacy of Essential Oils from Edible Plants as Insecticides Against the House Fly, Musca domestica L." Molecules. 14 (5): 1938–1947. doi: 10.3390/molecules14051938. PMID 19471213. ^ Hedin, Paul Arthur; Hedin, Paul A. (1991). Naturally Occurring Pest Bioregulators - ACS Symposium Series (ACS Publications). ACS Symposium Series. 449. doi: 10.1021/bk-1991-0449. ISBN 978-0-8412-1897-0. ^ Marzouki, H; Piras, A; Salah, KB; Medini, H; Pivetta, T; Bouzid, S; Marongiu, B; Falconieri, D (2009). "Essential oil composition and variability of Laurus nobilis L. growing in Tunisia, comparison and chemometric investigation of different plant organs". Nat Prod Res. 23 (4): 343–54. doi: 10.1080/14786410802076200. PMID 19296375. ^ Dietmar Schomburg; Margit Salzmann (11 November 2013). Enzyme Handbook: Volume 1: Class 4: Lyases. Springer Science & Business Media. pp. 270–. ISBN 978-3-642-86605-0. ^ Benwick, Bonnie S. (30 September 2014). "Bay leaf: Should it stay or should it go?". Washington Post. Retrieved 5 January 2018. ^ "Straight Dope: Are Bay Leaves Poisonous?". Retrieved 2009-04-11.